Are you the one by yourself in the kitchen making last-minute scrambled eggs for all your brunch guests? No longer! Make them ahead and pop them in the slow cooker. Thanks to a couple secret ingredients, they are so creamy and tender, I promise! Eric just looked at his calendar and said, Your parents’ fake anniversary is tomorrow! Eric: Tomorrow is your parents anniversary! But really, how lucky am I to have snagged a guy who not only remembers our anniversary, but my parent’s as well? Who am I to split hairs about the date? So when Eric called me up to ask me out on our first date, I added him to my phone as Eric 106 because that’s where he lived, apartment 106. We dated, (broke up, oops that was me sorry Eric), got engaged, got married, had some kids, and then one day a few years ago Eric finally changed it to “Eric Husband.” We’re simple folks over here guys. At least the EMTs will know who to call if I’m ever in an accident. Also, side note, I was just googling some of my recipes to find suggested posts below, (just add “charlatan,” any of my recipes should come up) and stumbled on this restaurant called Charlatan. It’s in Chicago, has anyone been?? Looks pretty tasty. So guys. 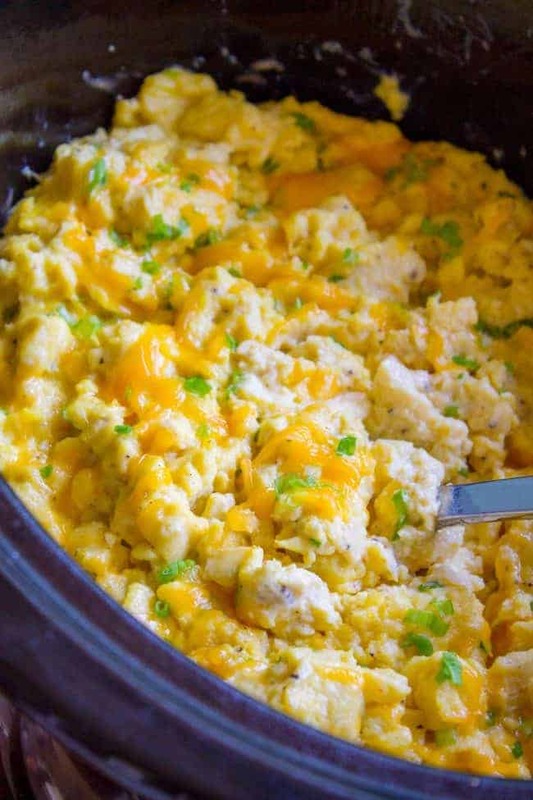 Scrambled eggs in the crock pot. Trust me just this once. No no, they’re not cooked in the crock pot, that’s not going to work. Just kept warm. 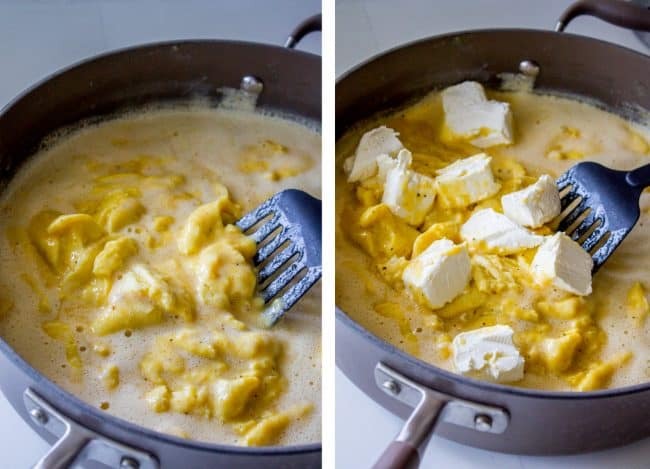 You whir them in the blender to get them all mixed up (or you could just whisk in a big bowl), cook them in a pan with a stick of butter, then add cream cheese when the curds start forming. The cream cheese is the secret to keeping these make-ahead eggs creamy, tender, and soft for hours. Now don’t scroll down to the ingredient list and get mad at me because it looks long. Most of those are just spices, because I like really interesting scrambled eggs. But if you’re a purist just use salt and pepper, by all means. This recipe is really just eggs, milk, spices, butter, and cream cheese. The recipe serves about 15 people, depending on how hungry your guests are. This is such a great way to plan ahead for holiday brunches, weekend guests, or even just a weekend at home. Of course you don’t have to make the whole amount. You could half the recipe, then keep it warm in the crock pot for lazy Saturdays when everyone seems to get up at different times. In a blender, add eggs, milk, and all the spices (salt, pepper, garlic, onion, mustard, seasoning salt, cayenne.) Make sure you have a big blender! Mine went over the 4 cup capacity at around 20 eggs and then I was too scared to add more so I just whisked them in. You could of course just skip blending and whisk them all in a bowl. Whatever sounds easier to you! Melt 1/2 cup butter in a 12 inch high-sided skillet over medium heat. When it is nice and hot, pour in the egg mixture. Lower the heat to medium-low. You have to cook eggs sloooow. Use a spatula to occasionally scrape the bottom of the pan. Cook for 10-15 minutes until the eggs are starting to set. Then add the cream cheese that has been cut into chunks. 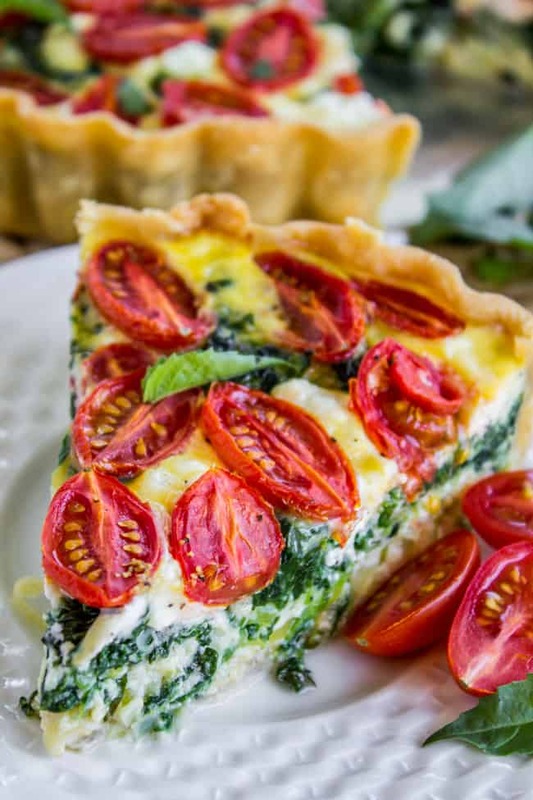 Carefully fold in the cream cheese and let it melt away into your dreamy creamy eggs. When the eggs have cooked (cooked meaning you're ok sneaking a bite) but are still quite wet, add the eggs to a crock pot and turn the crock pot to warm. (If there is no warm setting, the low setting will do.) Put the lid on. Stir the eggs every hour or so. You can keep them warm in the crock pot for about 4-5 hours. If you leave them in too long eventually they will become rubbery, so it's best to eat them within 4-5 hours. When serving, top with cheddar cheese and green onions. If you have a very large crowd to feed, you can double this recipe. Cook the eggs one batch at a time, and then you can add them to the same crock pot to keep warm. They should fit in a 6 or 7 quart crock pot. This recipe is mine, but I found the basic idea for it in a recent Food Network magazine. 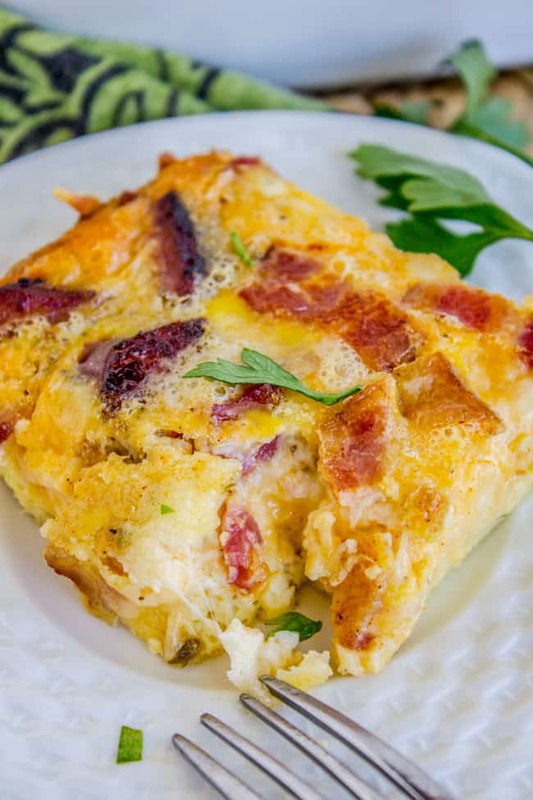 Cheesy Overnight Bacon and Egg Casserole << this is another good one to make ahead. 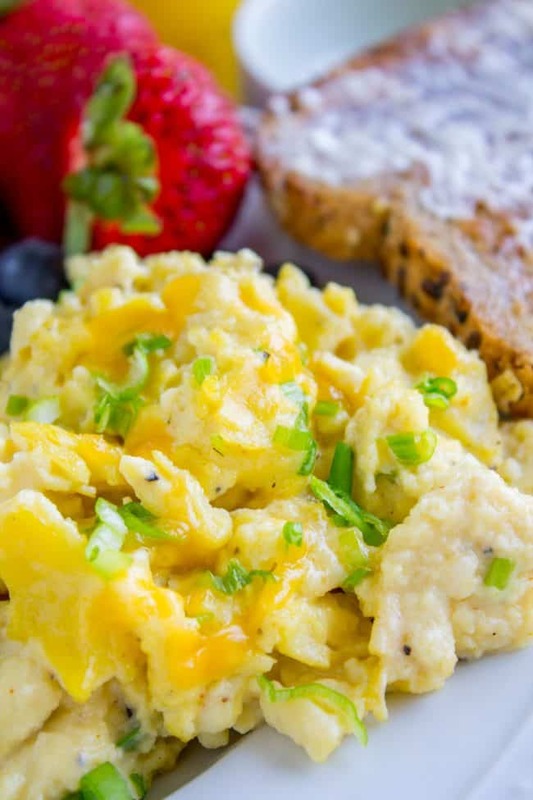 More scrambled eggs from blog friends! Made these for Easter brunch and they were devoured. 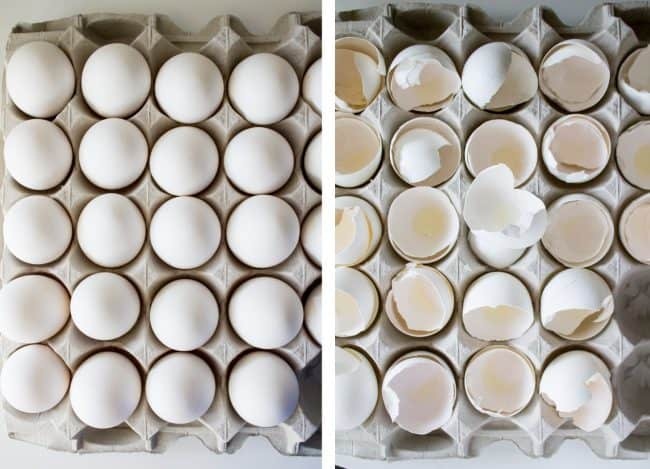 I had a carton of 18 eggs and a carton of 12 eggs on hand. I mixed up the original batch of 24 eggs, half & half, seasonings, and cream cheese. I didn’t increase any other ingredients though and the 30 scrambled eggs still turned out wonderfully creamy and remained that way until the contents of the crock pot were emptied several hours later. Oh Judy let me tell you, I totally understand the last minute addition of a few eggs (or whatever it is) when you have to feed a bunch of people! Will it be enough?? I’m so glad to hear that it was and that the recipe worked out just fine. It’s very forgiving that way! Thanks so much for the detailed review! Oooh American cheese is a great idea in this, I bet it was so gooey and delicious! Now you’ve given me a hankering to try my hand at cheese souffle. Yum! Thanks for the review Shanni! Easter breakfast for the family. Perfect scrambled eggs. I have added cream cheese before but never thought of using my crockpot! *facepalm* Thank you. Now I’m going to check your archives for a new ham recipe! Don’t use mustard powder unless you have the bright yellow kind–it will discolor the scrambled eggs and make look unappetizing. This isn’t really a necessary ingredient, anyway, to have these turn out delicious! Also, I substitute chive/onion cream cheese and that adds a nice kick! Great tips Rena! I’ve never seen mustard powder that wasn’t bright yellow, but I suppose if brown mustard is a thing then brown mustard powder must also be a thing, haha. Love the idea of using flavored cream cheese!! BEST Scrambled Eggs EVER!!!! I made these for a big family brunch and everyone raved about them. They stayed in the crockpot for 2 hours—although I was added a second batch. They didn’t last long once we started eating. Delicious!!! I’m so glad you guys liked them Kathy! They are perfect for a big family crowd. Thanks so much for reviewing! Hey Lara! Yes I bet it would work just fine! Let me know how it goes! This recipe is perfect for Keto & meal-prepping. I did chop up bacon and fried it. Then I added the egg mixture to the same pan, added some ghee and divided it into 12 bowls. Came out great. Thanks! Ooh love the idea of adding bacon! How can you wrong there. Thanks for the review Walt! I made this for a big group who helps prepares the church service in the morning. Cooked at 5AM and shared at 7AM, eaten in a snap. Got lots of compliments. Thanks for sharing. I made these for Christmas brunch and they were a big hit. Everyone loved the flavor and they were lovely in the crockpot all throughout brunch. Thank you for the great recipe! Hi Heather, I’m so glad the recipe worked out for you! Thank you for commenting! We served these eggs Christmas morning! Even the picky eaters raved about how delicious they were! Don’t hesitate to try this recipe. Our first guests arrived at 8:15 and the last to arrive was around 10:00…. the eggs were consistently tasteful and survived for hours in the slow cooker. We doubled the recipe for our crowd of 23, every guest gave this recipe a thumbs up! We will make them again! Enjoy! 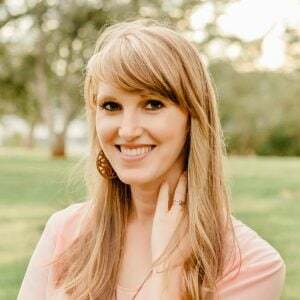 I’m so happy to hear this success story Maria! This dish is perfect for when people are arriving at different times. Thanks so much for commenting, it’s great to hear from you! 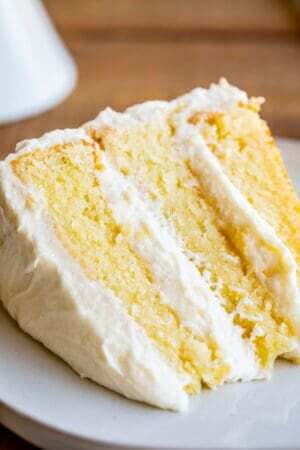 Thank you so much for this recipe – I am excited to try it tomorrow! It is the last day before Christmas break, and not only am I playing flute for my 2nd grade grandson’s AM and PM Holiday Music programs, but his teacher is having a brunch between the programs for parents and grandparents. Riley asked me to bring egg burritos! This will do the trick, as I have to leave home by 8:30am, and the brunch isn’t until 10:45am. Sounds like a busy fun day!! This recipe is perfect for when there’s so much going on! I hope you love it! Okay you are officially the BEST teacher in all the land! Your kids are going to love you! I’m so glad people somewhere still have class parties. We live in Sacramento, and at the schools here there are no holiday parties. It’s tragic. Some of my fondest childhood memories are parties at school. Oh, and the kids can’t have candy or anything sweet (even on birthdays!) because our district thinks they can solve the obesity epidemic apparently. So good on you for treating those kids! They will not forget it! I wish you were my kids’ teacher!! Thank you for the kind words! It was a lot of work but the kids loved it! I had parents asking me for the egg recipe because their kids came home raving about it ! We still do Christmas, Thanksgiving, Valentines Day, and end of year parties at my campus in Texas. Cupcakes are also allowed at the end of the day for birthdays ! Oh, you live in Texas, that explains it ;) My sister lives in Dallas, I’m tempted to just move there! Although this year BOTH of my kids teachers did a holiday (Christmas) party and I was SOO happy! I brought in contraband sugar cookies, haha! These are fabulous for a brunch but don’t sçrimp on the eggs! I did and everyone was asking for “more eggs”. Also, I used cream cheese with onion and chives and did not use the onion or garlic powders. Shared your recipe with a few guests. Did not use a slow cooker but the warming drawer of my oven. Eggs were kept for 3 hrs. And perfect..
Have you heard back if you can make this the night before? These look awesome! Wondering if you’ve ever done these in the oven? Hey Billi! No I haven’t tried them in the oven. You would probably want to keep it on the “keep warm” setting which is 170 degrees F. Let me know how it goes! Wonderful! Wonderful! Wonderful! I made these for our Sunday School class this morning so I could test them for a larger group at a summer youth church camp next week for 100+ teens and adults. The amounts were right on, the instructions were right on and the eggs tasted great! Thank you for your recipe. I will definitely be looking at your other recipes. Lucky Sunday School class and lucky youth campers! I’m so glad the recipe was such a success for you :) You’ve got a busy week ahead! Hope it all goes well. Thanks so much for your positive comment Kimberly! Means so much to me! That’s awesome Melanie, I’m so glad you liked the recipe! Thanks for coming back to comment, I love you! Hi Karen, I consider myself a very good cook and self taught. As good of a cook that I am, eggs have always been my albatross. Your scrambled egg recipe was the best egg recipe that I have ever tried. My wife’s family absolutely loved it. Thanks. Wow, high praise indeed Joe! I’m so happy to hear this! 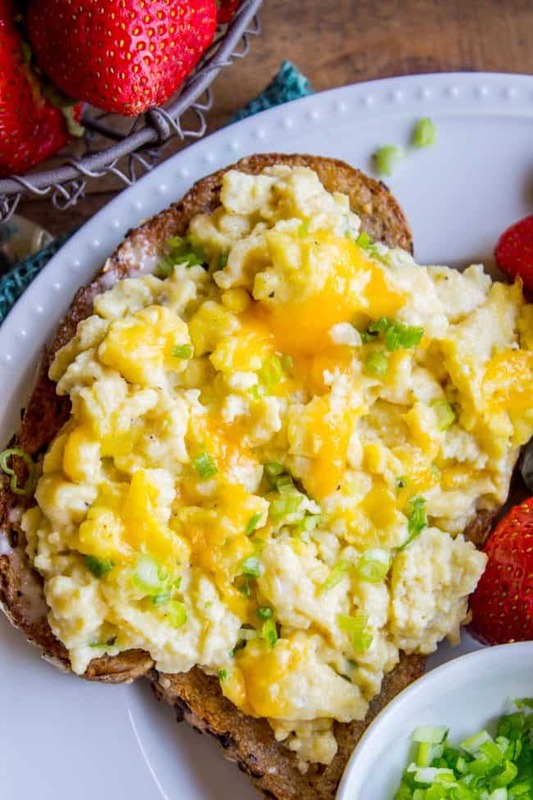 Turns out scrambled eggs is just one more thing on a very long list of items that cream cheese makes even more amazing, haha! Thanks so much for the review. I made this recipe for a breakfast potluck and they just disappeared. Everyone was asking for the recipe. I’m so happy to hear that Susan! That is the best feeling to have at a potluck ;) Thanks so much for the review!! I made a 1/4 recipe for my self and the hubby. Very good and did not dry out. I have a very large crowd I will be serving these eggs to but want to get as much done during the evening before. 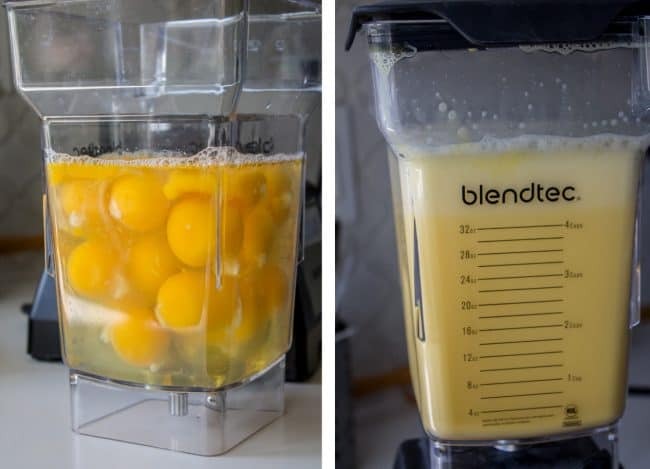 If I prepare the eggs up through all the liquid prep and then cook them in the morning, do you see any problem with chilling the blended eggs overnight? Thank you! Can you or have you ever added sausage and/or bacon? Hey Beth, I’ve never tried that! Did it work? I can’t see why it wouldn’t. Add it after the eggs are cooked. These look great! How long should they be in the crockpot before I serve them to guests? Hey James! These eggs can be eaten right away! They are just in the crock pot to stay warm. Have you ever transferred the eggs to a chafing dish instead of the crockpot to serve them? I never have Al! I bet it would work great! this looks delish..! do u reckon i could freeze the leftovers and re-heat them? I’ve never tried that Liana! I think I’d be nervous that they would get dried out/rubbery. Let me know how it goes! Hi! I just did a quarter batch to see how noticeable cream cheese was…not overwhelming at all!! 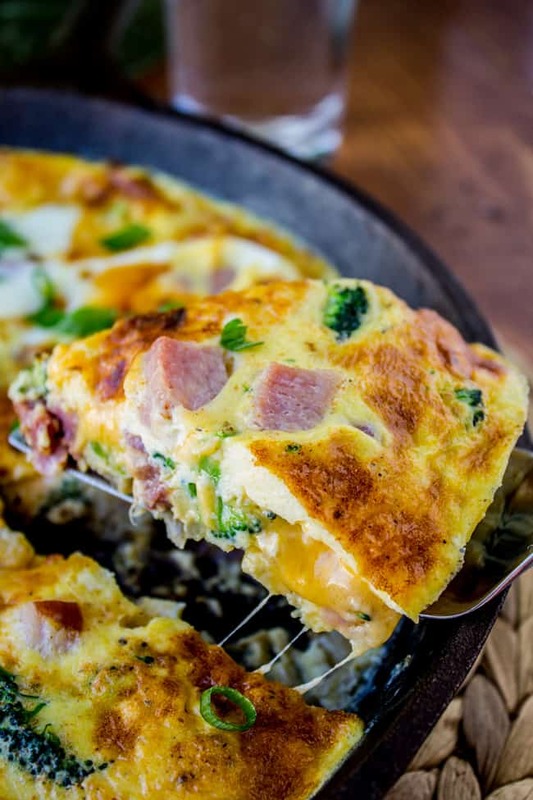 I plan on making this and putting in crock pot for transport to a breakfast meeting. I imagine 1 hour in crockpot so would I still need that much butter? Thank you!! Hey Michelle, I haven’t tried it with different amounts so you will just have to do some testing! Hope it works out! Made this for Christmas breakfast and it worked great! Did half a recipe but should have done a full one. Thanks so Much! Yay, I’m glad you liked it Kay! Thanks so much for the review! Merry Christmas! 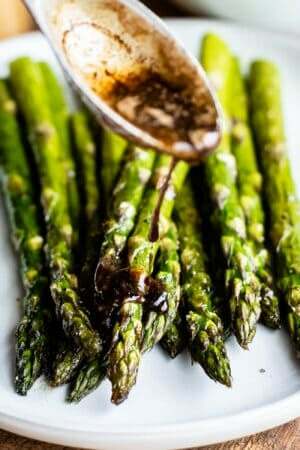 Can I make these the night before and then put them in the slow cooker the next morning? I’ve never tried it Shelly so I can’t be sure! I would worry about them getting dried out overnight. Let me know how it goes! excellent recipe. Delicious. Stayed warm and creamy (not runny) in the crock for hours. I omitted the milk. 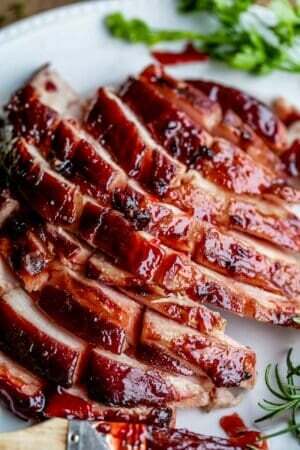 I will be making this for a crowd on Thanksgiving weekend. I think I will have to use more than 24 eggs though because on my trial run, 24 eggs barely filled half the crock pot and I feel that people over serve themselves scrambled eggs. I may have to use 36 or more eggs for 12-14 people. Sounds great! I love creamy eggs: but I’m not sure about the fat content… Have you tried it with neufchatel? Or olive oil in lieu of butter? Hey Beth! I haven’t tried it with neufchatel, I’m sure it would work fine. As for the olive oil…I don’t know. I definitely wouldn’t use a 1/2 cup. They might not be as creamy once they’ve sat in the crock pot. You will have to do some experimenting! Let me know how it goes! Wow! This dish seems so finger-licking! How many eggs should I use for 2 servings? Hey Agness! I’m not sure how 2 servings would work in the crock pot, or why you would need to keep warm eggs for 2 people. You could half the recipe no problem though! Let me know how it goes! This is absolutely genius!! Also, I love adding cream cheese to scrambled eggs. So crazy good! And always add garlic powder. Yum! How intense is the cream cheese flavor? I’m all for adding cream cheese to just about everything but I’ve got some picky children. 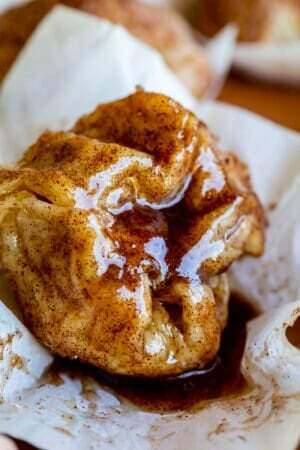 I think I will have to summon my inner Paula Dean when I make these. I am sooo excited to taste these and to have this recipe handy for the holidays. 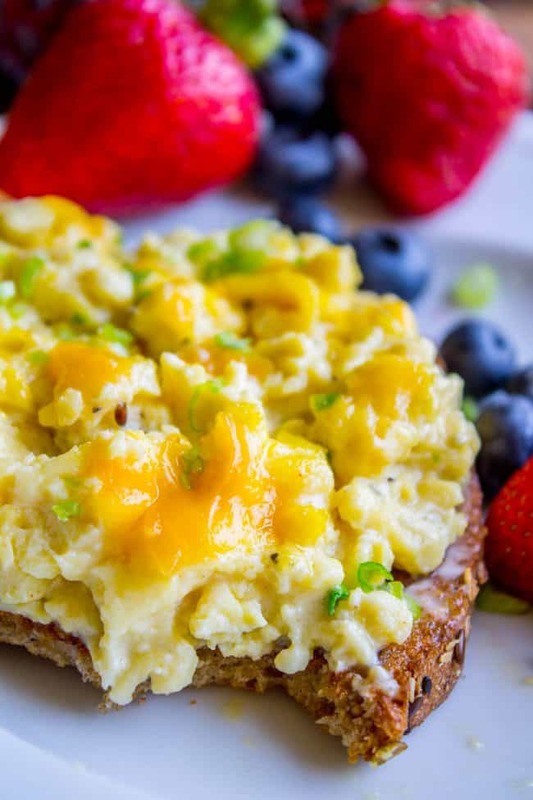 Nothing like creamy scrambled eggs…especially for a crowd! I’ve already emailed this post to myself so not to forget about it at the holidays! Delicious!